Gallery IS, is pleased to be showing a second solo collection of works by Red Deer artist Jeri-Lynn Ing this March. "Painterly Paintings" is a journey along the highway 1A, between Banff and Lac Louise. Jeri-Lynn made two trips, one in the fall and one in the winter, to gain the inspiration for this exhibit. Her paintings of these amazing landscapes observes the mountains, the trees and all the splendour of Alberta's nature scapes. This show will feature 10 large paintings in oil and acrylic. Escape the last breath of winter at Gallery IS. This show will run from March 1 to March 28, 2009. 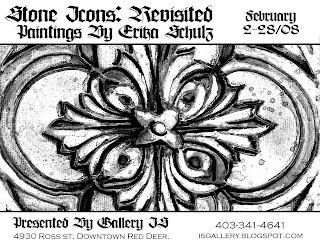 A new exhibit of original paintings by Erika Schulz is now on display at Gallery IS. This show runs from Feb 2nd to Feb 28th. Please visit the gallery on First Friday to speak with the artist about her newest artworks. February 6th, from 6:00 to 8:00pm. "Stone Icon" is an ongoing series. This theme will be re-explored in her largest group of these paintings. Since 2006 she has been exploring the mythology encapsulated in gargoyles, burial mounds, ancient statues, and wall carvings, all of which were meant to carry a message through time. They were meant to scare us, inspire us, record history, and immortalize the dead. Today we still marvel at their ability to convey a message, and admire the decorative beauty. After travelling to England in the spring of 2008, Erika was inspired once again to capture the strength and mystery of these carvings, large and small, in her unique "drawing with paint" technique. Stone Henge, Ancient Rome, Mythology, Castles, Churches and Mausoleums all inspired these works.